The 11 April 2003 issue of the Tubeworker bulletin calls for solidarity with a fight for democracy in Iraq. It condemns the London Underground bosses' move to charge union activist Glenroy Watson with "gross misconduct" for a routine mishap. And it reviews proposals which the bosses are discussing for the Tube now that PPP is fully installed. Download as two pdfs, front page (30K) and back page (423K). The Tubeworker bulletin for 25 February 2003, under the headline "No to war, no to Saddam", calls for industrial action against the planned US/UK war on Iraq. Also in this bulletin: pitfalls with a long-term pay deal; the Central Line safety scandal; London Underground's move to make drivers work longer shifts. Download the bulletin as a pdf here. Tubeworker of 30 January leads on the Chancery Lane crash which avoided numerous deaths only by good luck, and which has led to the closure of the Central Line for at least a couple of weeks. Download it here in pdf format. The "Tubeworker" bulletin of 19 January leads on the JNP privatisation (first stage of part-privatisation of the Tube) and the FBU dispute. Download the front page here, and the back page here - both pdfs. The new issue of the Tubeworker bulletin argues for solidarity with the firefighters. Download the front page here and the back page here. The new issue of the Workers' Liberty Tubeworker bulletin reports on Tube workers stopping the job on safety grounds during the first FBU strike, and argues the case for continuing the action during further FBU strikes. Download the bulletin here (pdf, 865K). The new issue of the Workers' Liberty Tubeworker bulletin, downloadable here, says that Tube workers should refuse to operate trains and stations during FBU strikes on grounds of safety. The unions, RMT and ASLEF, have circulated leaflets informing workers about their rights to refuse to work in what they consider unsafe conditions, but Tubeworker is the only literature circulated to Underground workers making an outright call to refuse. London Underground workers, members of RMT and ASLEF, struck for 24 hours on 24-25 September in pursuit of our pay claim. Picket lines on the morning of 25 September were strong and confident, and the strike effectively shut down almost the whole system. Another 24 hour strike is due on 1-2 October, roughly coinciding with the local government unions' London weighting strike on 1 October. Further action is due to be discussed at the RMT's London Regional Council on Thursday 26 September. Workers on the London Underground, members of the RMT and ASLEF unions, are staging a second 24-hour strike over pay from 8pm on Tuesday 1 October to 8pm on Wednesday 2 October. Their first 24-hour strike, on 24-25 September, shut down the Underground completely. 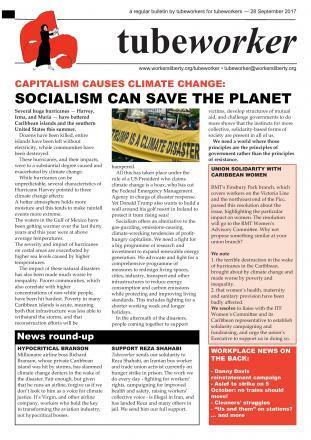 Read the Workers' Liberty Tubeworker bulletin for 1 October here. Workers on the London Underground, members of the RMT and ASLEF unions, are striking over pay on 24 September and 1 October. Read the Workers' Liberty Tubeworker bulletin here.